The Malacologist (ISSN 1759-1406), Bulletin of The Malacological Society of London, is The Society’s newsletter, distributed twice yearly to members in February and August. The Malacologist carries Society notices and informal articles, including research reports from grant holders, together with news, correspondence and opinion, reports of meetings, book news and reviews, and a diary of forthcoming meetings of interest to malacologists. 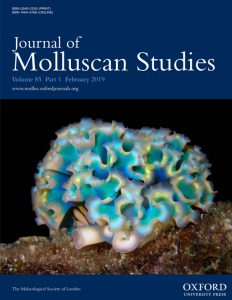 The Malacologist was first published as The Bulletin of The Malacological Society of London, but with Volume 45 (February 2005) it also carried its new name, reflecting an emphasis on researchers as much as molluscs. Back issues from Volume 28 (Feb 1997), are archived on The Society’s website. Starting with issue 55 (August 2010) The Malacologist is distributed predominantly as a pdf by email, although members can opt to receive paper copy. Additionally, a brief Malacologist Update with news of forthcoming meetings and other time-sensitive information, is distributed to members by email in April, June, October and December.